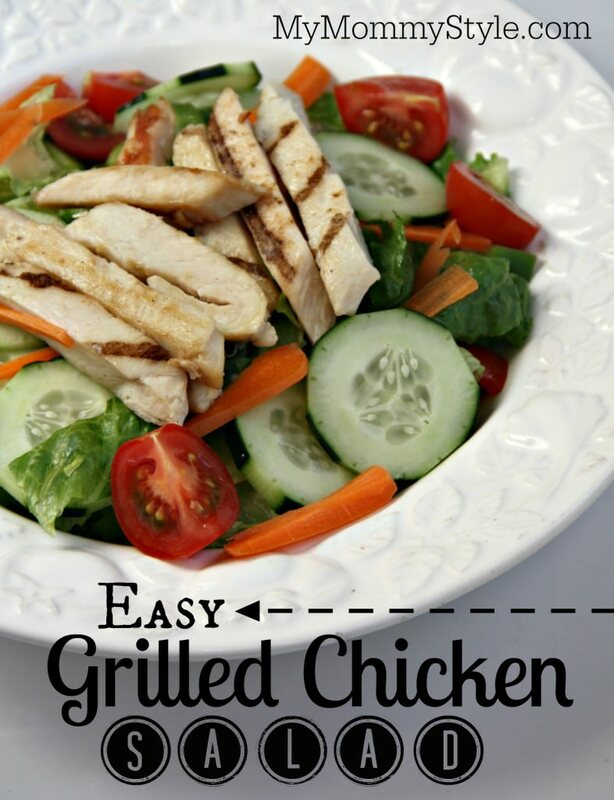 Grilled chicken salads are one of my favorite go-to meals when I need something quick. They’re easy, healthy, and you can change them up a million different ways with the type of dressing you use, the marinades and herbs you can use on the chicken and even the vegetables you use inside the salad. I usually like to use these with leftover chicken, but I have also used rotisserie chicken or even the pre-grilled bags of chicken at the store. This recipe is just the typical salad I make, but you can change it up however you would like. Add whatever veggies you have on hand, leave off the ones you don’t like. You can even serve this buffet style so everyone can take what they like. Here is a great list of salad topping ideas if you get stuck. Wash and prepare all your vegetables and divide onto four plates. Add chicken to the top of salad. Serve with dressing of your choice. 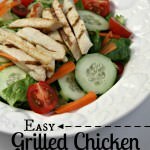 Here is one of my favorite homemade vinaigrette dressings to add to grilled chicken salads. It’s so simple and fresh and is the perfect tangy addition to any salad.